This customizable private walking tour of Amsterdam will show many of its contemporary highlights from a local perspective. Enjoy a 4-hour private walking tour – including 2 short but scenic ferry rides – of the beautiful city of Amsterdam and discover the contemporary directions in architecture and culture the city has taken over the last few decades. In addition to all the sights, your personal Amsterdam guide will reveal the city’s unique character, teach you local history and culture, and give you insider’s tips about great local restaurants, shops, attractions, activities, public transport and more. - A moderate amount of walking is involved. - This tour involves approximately 5 kilometers or 3 miles of walking. We advise you to wear comfortable shoes and clothing and not to bring any heavy bags. Your morning or afternoon in Amsterdam will start at the Passenger Terminal Amsterdam, constructed in the shape of a wave. Set off in a relaxing pace to make sure you really get to see, feel and learn all about this part of the town. Enjoy the fascinating private walking tour of the beautiful city of Amsterdam and discover its unique and thrilling contemporary side. Start your walk to the former KNSM dockyard isles. The KNSM isle is a living area in the former eastern harbour of Amsterdam, taken over by the young nomads, artists and squatters in the 1980s, and rebuilt in a district of splendor during an urban renewal project in the 1990s. 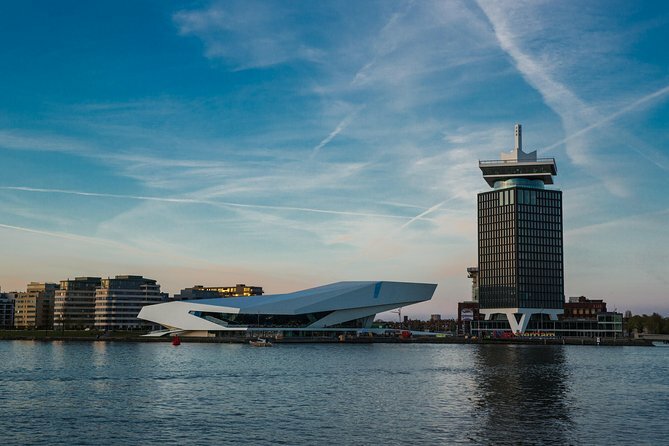 The next highlight of the tour are two short ferry rides, the first towards the NDS dockyard with spectacular views of the former harbour area, and the second to the famous EYE building, home of the Amsterdam Film museum. Tour the striking building and visit its permanent exhibition before you end the tour. Let our guide take you through the streets of Amsterdam and discover the future of Amsterdam.